Tomorrow is the anniversary of T.E. Lawrence’s death. Known to the world as Lawrence of Arabia, he was an archaeologist and an adventurer. 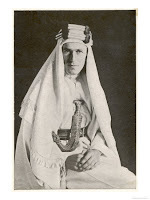 A spy for the British throughout Arabia during the Great War, he could pass as a native of the region. After that war he fought for an independent Arabia. Coming home to England only after his vision for a united Arabian nation was dashed. In 1927 he wrote his memoirs and they created a sensation throughout the staid, somewhat damp England of the 1920s. A man of contradictions he worked by day as a mechanic for the RAF. In 1932, he published his own translation of The Odyssey under the assumed name of T.E. Shaw. He died from injuries sustained in a motorcycle accident. But he has been immortalized in books and the classic film, Lawrence of Arabia. Not to mention the numerous cameo appearances he has put in since his death. He even showed up in an episode of The Young Indiana Jones. A character who was inspired in part by his legend. All of this got me to thinking about reader’s preferences when it comes to novels. I personally love to see “real” characters interwoven in historical fiction. To me it helps to round out the story world. But it can be done well and it can be done poorly. And as with every other aspect of life, tastes vary. I think the best use of an historical figure in fiction occurs when their legacy is honored, but bolstered by little known facets or facts that enhance the reader's understanding of who the person was beneath their fame. I don't like known facts to be contradicted by fiction. Like giving George Washington a tendency to beat Martha just because the author thinks it adds to the tension. By all means, feel free to have a character like that if it works for you story. Don't make it a well-known and beloved historical figure. Some of my favorite portrayals of real-life characters are from Brock and Bodie Thoene's World War II novels. They use several historical personalities from Churchill to William Randolph Hurst. And the King's Speech was a great recent movie that was a fictionalized account of a real person's life and struggles, and it totally worked! Do you like to see real-life characters in a novel? What if they are the main character? Is there a point when it feels like too much? Good morning, Lisa. Interesting post. There are repeated references and a cameo appearance of Florence Nightingale in Anne Perry's William Monk historical mystery series. I think a light hand on this gives historic accuracy. For me,the line is crossed when the author is so enthralled by a certain historical character that he/she is brought in repeatedly in a way that doesn't advance the plot. It's like name-dropping. I like reading about real life people, but I'm afraid to write about them. I think part of the reason I stopped halfway through my sequel to Dandelion was because it was time for the first real historical character, King Edward III, to make an appearance. I was terrified to get him right. I also want her to become friends with Lady Jane Gray. Also a scary prospect. I'm happiest in my fictional little village and castle and convent with my fictional characters. Real people and places intimidate me. I usually don't mind a cameo appearance of a real person if it doesn't feel (like Barbara said) like name-dropping. And I usually don't like fictionalized accounts of real people. However, there are some major exceptions to that! Susan Meissner did a fabulous job with Lady Jane Gray. And Jill Eileen Smith did the same with Michal (from the Bible). And one of my favorite books in college was Those Who Love by Irving Stone, a novel about John and Abigail Adams. I think the key to making "famous" people believable as a main character is crafting them enough like their historical selves to give authenticity but giving them the same multi-dimensional lives you would your made up characters. I agree with your points, Lisa. Love Brock and Bodie Thoene too!! Good point, Barb. It's got to feel natural to the plot. Organic so to speak, or just like anything else it feels off to the reader. Dina, I bet you could do a great job. But there's so much research already in a historical, it may not be worth it to have to do all the other research into a single person's life. It would certainly be a trade-off. Especially if the character is at all controversial. I mean the British have a very different perspective on Benedict Arnold than Americans. It'd be hard not to make someone crazy no matter how diligent you were in your research or true-to-life your character. Anne, I think I'd really like that novelization of John and Abigail Adams. There's a couple who certainly wouldn't have been typecast by Hollywood for a great romance, and yet, they had a precious marriage partnership. I just love it. Thanks, Cheryl. Have you read their Love Finds You novel set in Hawaii? They did a fictionalized account of one of the Hawaiian princesses before, during and after the take over of Hawaii. And of course it was a love story. It was good. But then I wouldn't expect any less from them! Interesting post, Lisa! I definitely enjoy reading fictionalized accounts of historical figures, and I don't mind them dropping into fiction as characters as long as it's natural. But so far, I've been afraid to write them in, myself. I'll have to think about this one! I like to see historical figures in books, but not so much as main characters. That's really hard to get right because the author is taking you into a real persons head. And there is a point where it gets to be too much! Faye, overall I think I;m in your camp. I like real people as minor or secondary characters, but usually not so much as a main character. Probably because real life is just not the stuff fiction is made of! I never saw the movie Lawrence of Arabia, didn't know any of this about him, and didn't realize Indie was inspired by him. How very cool. I love that he wrote a version of The Odyssey. You are such a wealth of info, Lisa. I love reading about real people and love when they make cameo appearances in historical novels. But like you, I don't want them to alter the personality just to fit it in their storyline. I think little known facts are great little tidbits that usually jumpstart a writer's imagination. Very true, Suzie. Like making Indy an archaeologist and having him have those kind of larger than life adventures. George Lucas was smart in that he just took his inspiration from a real life person. He didn't try to do a documentary. Great discussion. I love the use of real people in historicals though I have no plans to include any in mine. I hope to read Laurence of Arabia's memoirs some day. I didn't realize he'd written them. I think reading the Elizabeth Peters mysteries have really increased my love of that time period. I enjoy the inclusion of Howard Carter and Lord Caernarvan. Egypt and the early archaological discoveries. Good stuff. Deb, did you ever wonder if she based Cyrus on a real person, or if he was a pure figment of her imagination? And you know, I think she had a couple other real-life people. Did she have one of the Pankhursts in one of the stories set in England? Something to do with suffrage of course. I'm listening to an audio book that includes Oliver Wendell Holmes as a secondary character. I think it works that way, but wouldn't necessarily want a real-life historical figure to be the main character in a fiction book. I love audio books, Niki! I think the consensus from this small sampling is we like real-life characters with walk-on roles that feel "real," and organic to the story. This was good or me as I do have a couple of real characters in some of my stories. They are all minor, but I will definitely keep all this in mind as I go forward. Fascinating post, Lisa. And I totally agree with you. I don't see any reason to blight the name of a famous person just to up the tension in your own. If you need tricks like that, you shouldn't be writing. And I also agree that the best way to mention a famous person is to offer a little known fact. I love it when that happens. I feel richer for the experience of reading that book.